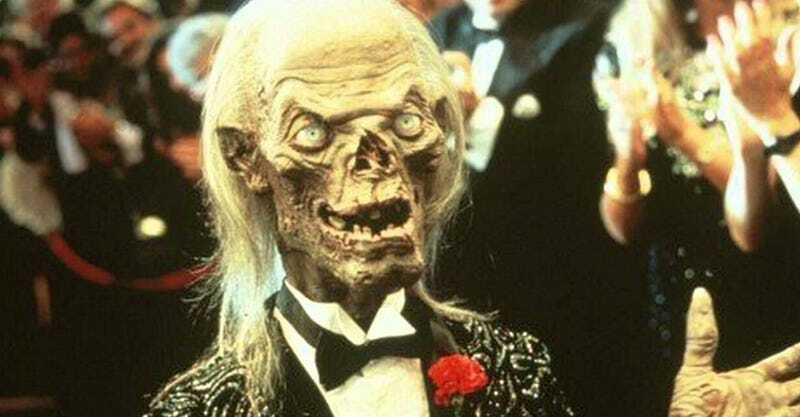 When you say “Tales from the Crypt” most people immediately think of the Crypt Keeper. He didn’t have the most screen time but the gross, frightening, cheeky host of the 90s HBO anthology series was undoubtedly the star. And he probably won’t be back for the remake. The story starts Thursday when it was revealed M. Night Shyamalan will produce a new version of the show for TNT sometime in the future as part of a weekly two-hour block of horror programming. Which was weird news unto itself. Then, horror website Bloody Disgusting reported that the Crypt Keeper wouldn’t be part of the show because HBO still owned the rights to the character. You see, Tales from the Crypt was based on a 1950s series of comic books that were hosted by multiple characters. There was a Crypt Keeper, but he didn’t look like the one we know from HBO. That Crypt Keeper was created for that show, hence the issue. Instead, this new show “will be highlighted by an old man with a cane, wearing a hood, and keeping warm by a fireplace,” according to the report. A report that’s bolstered by this tweet by John Kassir, the voice of the HBO Crypt Keeper. That’s disappointing for sure—and there’s more. The site also reports, unlike the HBO series, the current idea is for Tales from the Crypt to tell one single, season long story. (I guess TNT didn’t notice the plural of “Tale” in the title.) That story may be about voodoo in New Orleans, as written by the team behind Hemlock Grove. If true, none of this is good news for fans who were hoping for a bit of that HBO nostalgia.